A Process in Targetprocess is a set of business rules applied to the Workflow of your Project or Team. Practice settings and a list of available Practices. If some of them are toggled off, the corresponding entity types can't be added to your Project or Team. Your Effort units, Effort calculation model, and Time tracking settings can also be found in Practice settings. Modifying the Process or Workflow in the middle of the Project is a potentially unsafe operation! Read more about how to safely change a Process. 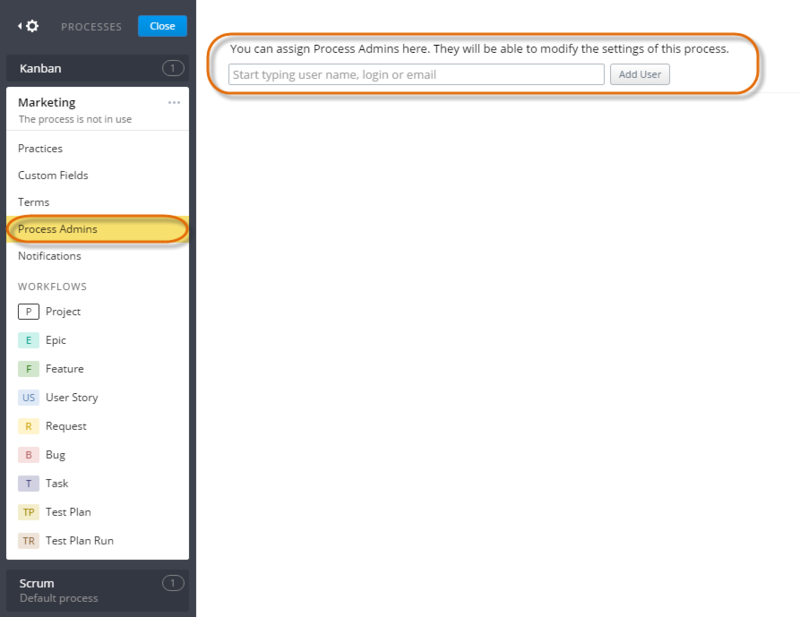 Every Administrator in Targetprocess can edit Process settings by going to Settings → Process setup. 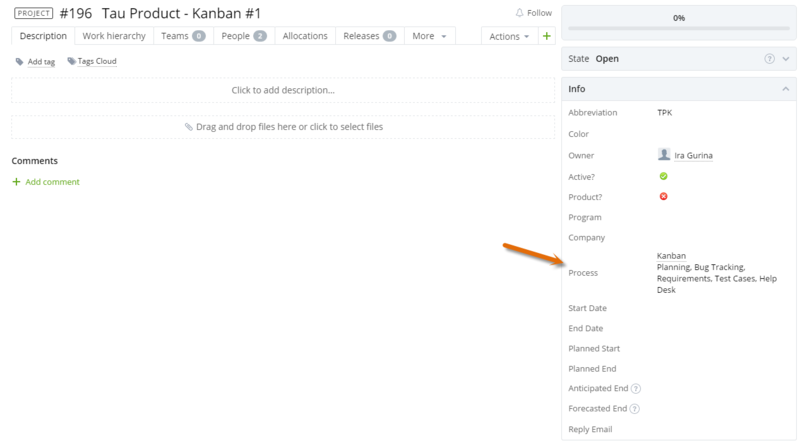 Select “Process setup.” The Process list will appear in the left menu. It is possible to define additional Process Administrators, who have the right to modify a certain Process they are responsible for. Please see the “Process Admins” section for details. When you go to edit a Process, the first thing you should notice is some small text below the Process name that indicates how many Projects are using this Process. Clicking on this text reveals a tooltip that shows the specific Projects using this Process. There are several actions you can perform on a Process: rename, clone, and delete. To rename a Process, just click on the three dots next to the Process name. This will open the actions menu. Choose “Rename” from the menu. The Process name turns into an input field. Make your changes and apply them by hitting the return key on your keyboard. Processes can be cloned, so you don't need to start from scratch if you only want to make small changes but still keep the original version of the process. 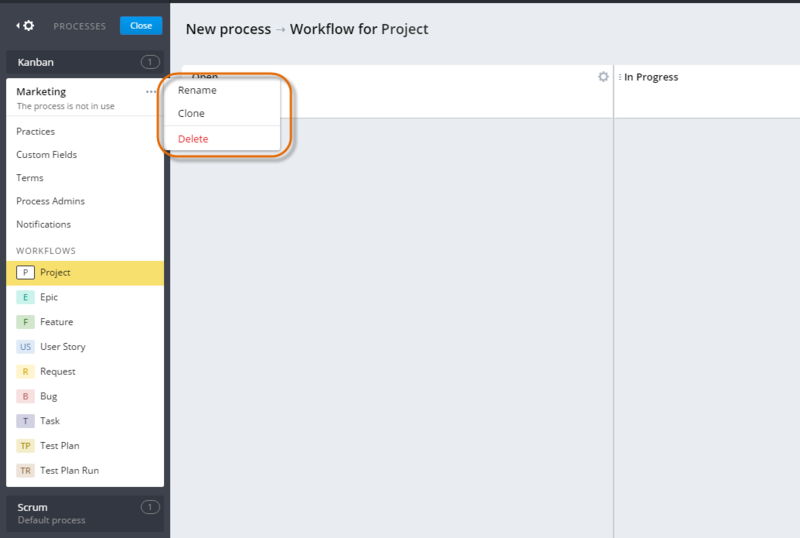 Select the “Clone” option from the actions menu right next to the Process name. A copy of this process will be created immediately. Only Process which are not used by any Project can be deleted. As mentioned above, Process usage is indicated right below the Process name. To delete a Process, open the actions menu right next to the Process name. Select “Delete” from the menu and confirm your action with “Yes, I’m sure” when prompted. Practices aggregate functionalities that you can either use or not use in your process. Let’s say you don’t need high level requirements, because you only use User Stories. Just disable the “Epics and Features” practice and the related functionality will be removed from Targetprocess' GUI. How do I add new Custom Fields? Sometimes the default terms of our entities (like “User Story”) don't fit your company's vernacular. Lets say you’re setting up a Process for your marketing department and you would like to change the term of our Releases to “Initiative”. You can easily do this in the Terms section of Process setup. Just type your own term into the two input fields for the specific entity that you would like to rename. The first input field is for the singular version of you term; the second one is for the plural version. You can restore the default terms at any time by simply removing your custom terms from the input fields or by using the “Reset to default” button at the top. Process admins have the right to modify the setup of a Process. Process admins can only be appointed by an Administrator user. Just go to Settings → Process setup → Process Admins. Type the user name, login, or email of the specific user and hit the “Add user” button. Email notifications are flexible and can be customized. Read more on how to set up Email notifications on various events. Workflow settings for all available entities (including Available States, their Names and Order, Allowed State Transitions and Roles available in the Assignments area for Assignable entities) are included in Process settings. 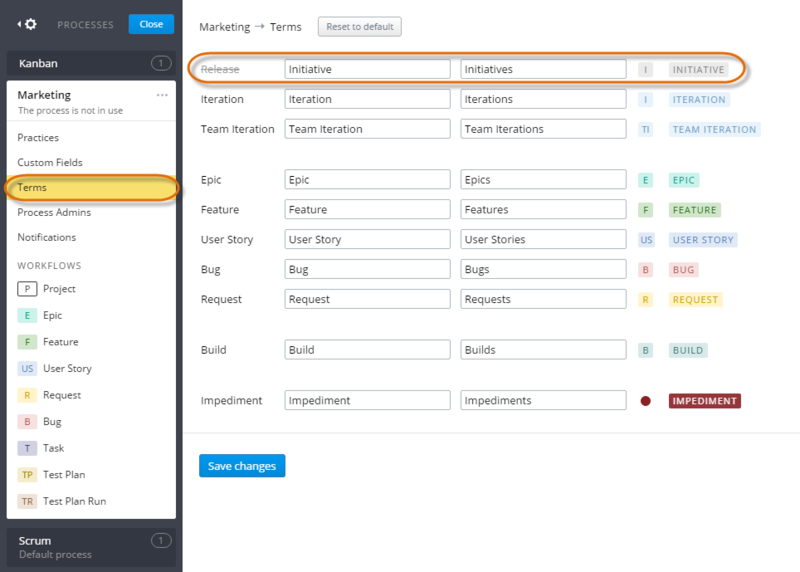 Read more on how to customize States and Workflows.